Obviously, you will wish to uninstall or deactivate Windows product key from your old Windows PC if you are going to use a new Windows computer. Transferring Windows product key from one computer to another is one of the most helpful ways for Windows Users. This is the main reason, Windows users like to deactivate windows product key from the old computer before selling or recycling and use it on a different PC or new computer. If you are also one of them who want to learn the process of uninstalling or deactivating Windows product key and activating that Windows license key on another computer then this guide is quite perfect for you. Step (1): Firstly, open command prompt with administrator privileges. To do so, click on Start button and type cmd in the Search box. From the search result, right-click on cmd.exe and select “Run as administrator” option. Step (3): Just after pressing Enter button, Windows Script Host message box will appear on your screen along with Software licensing service information. Step (4): From the Windows Script Host message box, write down your Windows Activation ID to later use and click on OK.(activation ID is directed in the above screenshot). Step (6): Just after the press, a pop-up window will appear saying “Uninstalled product key successfully“. That’s it. Thus, you can easily uninstall or deactivate Windows product key from your Windows Computer. 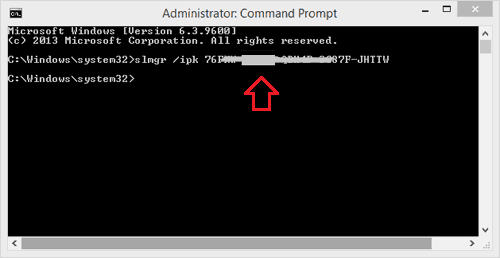 Step (1): Firstly, open an elevated Command Prompt. To do so, click on Start button and type cmd in the Search box. From the search result, right-click on cmd.exe and select “Run as administrator” option. Important Note: Here you have to enter the Windows product key, not the Activation ID you received during the Windows product key deactivation. Step (3): Just after the pressing Enter button, a pop-up window will appear saying “Installed product key (your Windows product key) successfully”. That’s it. Thus, you can see how simple is to install Windows product key on Windows PC. This Windows product key deactivation and Windows product key activation guide will work on all Windows operating systems. So, follow the above-mentioned steps and efficiently activate or deactivate windows 7 product key, windows 8 product key and all other versions of Windows product keys. Feel free to share with us through comments if you know another way to activate and deactivate Windows product key on Windows Computers. Just a quick note the last commands are slmGR not slmrg. there are typos in the example but im sure everyone has figured it out! thanks for the post! helped me great deal!